Do you have podophobia? The fear of feet. If so, then this post is not for your eyes! I'm dead serious. All your going to see is photos of my gross feet! HA. Ok I warned you! Now for those of you brave enough to stick around I've got to tell you about my new discovery. I received THIS Japanese product for X'mas from a friend who swears by it. A very cool product, made by the Japanese, out of fruit acids. 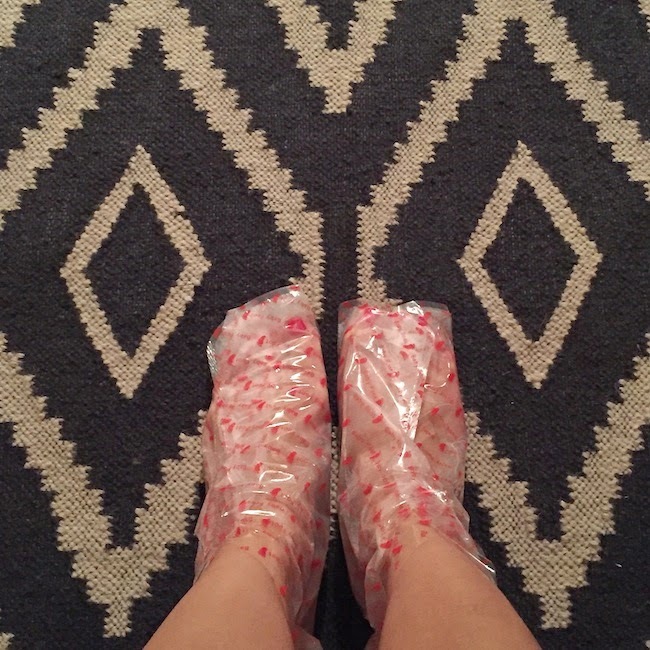 1 box includes a pair of booties, and the gel solution is inside each bootie. Very easy to apply and follow directions. I was PSYCHED to try it, since after two pregnancies my feet aren't the prettiest. Plus this dry winter weather is especially not helping my callous and cracked heels. Before applying this product I got a pedicure to prep my feet with a scrub, and that was also a good way to be sure I soaked my feet as per the directions. Don't bother painting your toe nails because whatever is in those booties is potent and my nail polish was half eaten off! CRAP. You need to leave the booties on for 1 hour. It's slippery to walk in plastic so you can't really be up and about. Find time when you can sit down for a full hour on the computer, read or watch TV. Then when times up go wash it off well with soap and water, and forget about it. You will NOT see immediate results, so don't expect instant magic! A week later I'm at Yoga and half way through class I see what looked like dandruff all over my mat towel. Oh no! 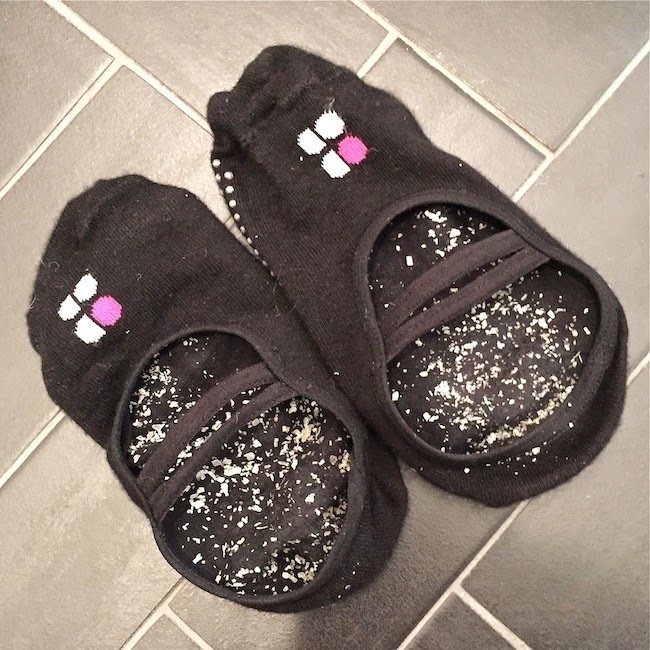 I first was shocked because had forgotten about doing the foot treatment, then I was grossed out, and then embarrassed and hoping no one around me saw the flakes all over my towel. HA. Totally killed my zen moment! This is what my feet looked like when I got home. My feet continuously shed like a snake for a week. Day 3 and 4 was the worst it got. Not only the soles of my feet peeled but also the tops and a little around my ankles. I looked like I had a serious case of athletes foot! So GROSS. 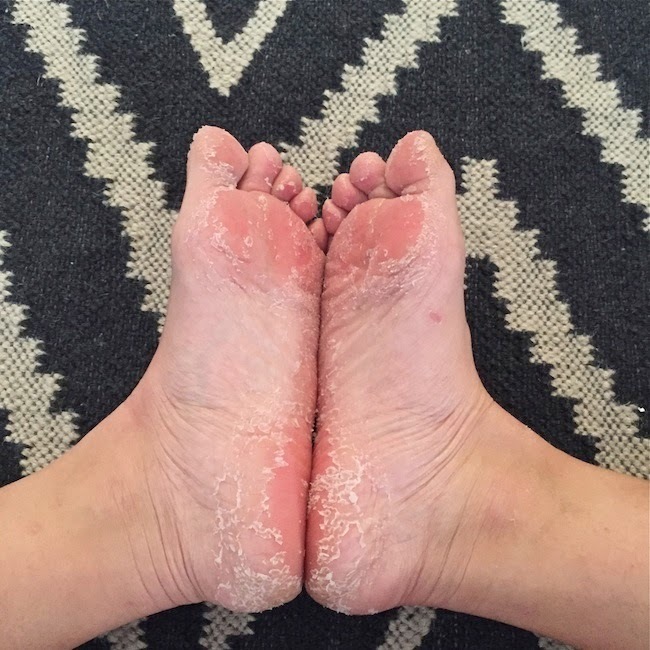 Socks are mandatory during this week of peeling, unless you don't mind having your dead skin all over the place. It was insane how much my socks collected. If it's going to gross you out wear white socks! So there's the low down of what to expect! 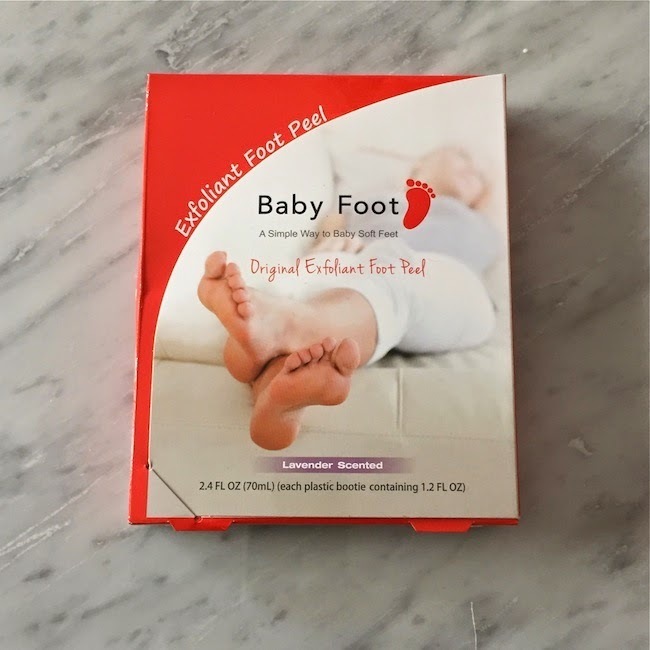 If your feet need some TLC you are a good candidate to try Baby Foot exfoliant. I got fantastic results, and my feet have remained smooth two weeks after the peeling stopped, so a month since my last pedicure. That's great since I usually get monthly pedicures. I wonder how long it will stay baby smooth? I'll definitely be doing another round come May before memorial day weekend, and the start to wearing sandals and flip flops. It's a MUST.